We propose a hierarchical Bayesian model that refines a population-based atlas using resting-state fMRI (rs-fMRI) coherence. Our method starts from an initial parcellation and then iteratively reassigns the voxel memberships at the subject level. Our algorithm uses a maximum a posteriori inference strategy based on the neighboring voxel assignments and the Pearson correlation coefficients between the voxel time series and the parcel reference signals. Our method is generalizable to different initial atlases, ensures spatial and temporal contiguity in the final network organization, and can handle subjects with brain lesions, whose rs-fMRI data varies tremendously from that of a healthy cohort. 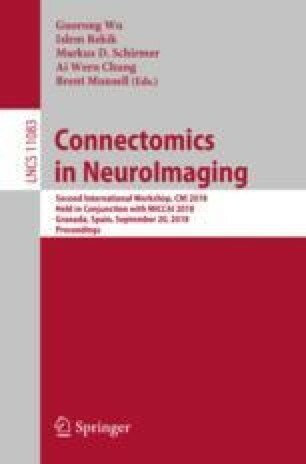 We validate our method by comparing the intra-network cohesion and the motor network identification against two baselines: a standard functional parcellation with no reassignment and a recently published method with a purely data-driven reassignment procedure. Our method outperforms the original functional parcellation in intra-network cohesion and both methods in motor network identification. This work was supported by the RSNA Research & Education Foundation Carestream Health RSNA Research Scholar Grant; Contract grant number: RSCH1420.